National Trail’s girls golf team advanced to the state tournament for the first time since 2012 with its first-ever district runner-up finish last week at PipeStone Golf Course. Pictured, left to right, Katelyn Hines, Caitlin Gilland, coach Troy Ferguson, Savanna Abner, Makena Laird and Makenna Jones. The team will compete Friday and Saturday, Oct. 12-13 at The Ohio State University Gray Course. MIAMISBURG —With three golfers still on the course, all three team qualifying spots for the state tournament was still up for grabs at the Division II girls district golf tournament at PipeStone Golf Course. It wasn’t until National Trail junior Makenna Jones knocked in a three-foot putt for par on the 18th hole that sealed the fate of the Blazers chances of moving on. 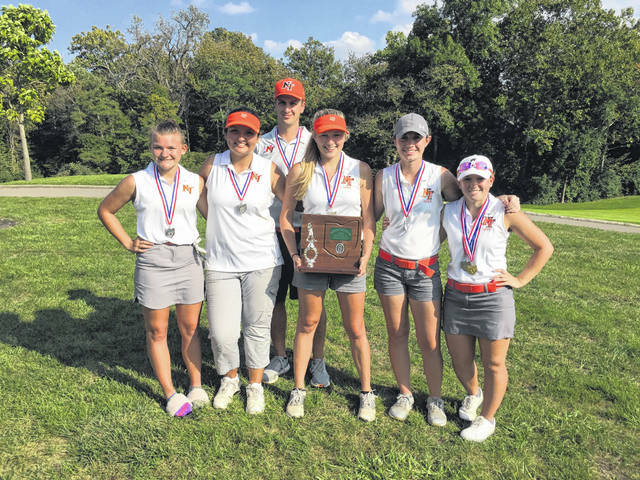 The putt secured a district runner-up for the Blazers — the first in program history — and a spot at this week’s state tournament to be held Friday and Saturday, Oct. 12-13, at The Ohio State University Gray Course. Cincinnati Wyoming won the tournament with a team score of 366. NT was second with a 376, winning a tie-breaker of third place Ben Logan. Alter, Carroll and Versailles are shot 378. The tournament was held Wednesday, Oct. 3. “The girls played really well on a pretty tough course and shot a team-season best 376,” Trail coach Troy Ferguson said. Jones led the way firing a 78, which earned her District Champion honors. Savanna Abner and Katelyn Hines both carded 97’s and Caitlin Gilland shot a 104. Makena Laird’s 106 was the tiebreaker. Eaton’s Ainesleigh Elstro shot a 100 to finish 34th. For the boys, Tri-County North placed fourth at the Division III district at Beavercreek Golf Club on Thursday. The Panthers, which shot a 359, fell one spot shy of advancing to state. Dylan Curtin shot a team-best 86. He was followed by Alec Wayman (90), Ethan Kelley (91), Spencer Brehm (92) and Matt O’Dell (109). Newton (343), Ft. Loramie (344) and Seven Hills (349) qualified for state. Twin Valley South’s Willie Bowman shot a 93 and finished 34th. https://www.registerherald.com/wp-content/uploads/sites/41/2018/10/web1_ntgg6.jpgNational Trail’s girls golf team advanced to the state tournament for the first time since 2012 with its first-ever district runner-up finish last week at PipeStone Golf Course. Pictured, left to right, Katelyn Hines, Caitlin Gilland, coach Troy Ferguson, Savanna Abner, Makena Laird and Makenna Jones. The team will compete Friday and Saturday, Oct. 12-13 at The Ohio State University Gray Course.